Photo opportunities in such an edgy and colourful metropolis as Melbourne need only the slightest of creative eyes to completely embody the quintessential energy of this incredible city. The art, multiculturalism, music and architecture provide a wealth of interesting and ever-changing subjects to capture, both in the CBD (central business district) of Melbourne and beyond, in the suburbs. Whether you’re just interested to pimp up your Instagram, you’re a budding learner or fully-fledged professional photographer looking for some interesting places to start shooting, here is a guide to some of the most photogenic and iconic spots in Melbourne. Cameras and phones at the ready! At sunrise most mornings throughout the year, hot air balloons giving rides to tourists clutter the skies of Melbourne. With the warm glow of the sky (which is often pink in the summer) and the awakening cityscape as a backdrop, the hot air balloons make for a really stand-out shot. The exact launch points differ daily depending on the weather conditions, but most begin around Port Melbourne, in front of Albert Park. They take tourists all over the city as well as across the parks and suburbs, such as St. Kilda, where they often land. 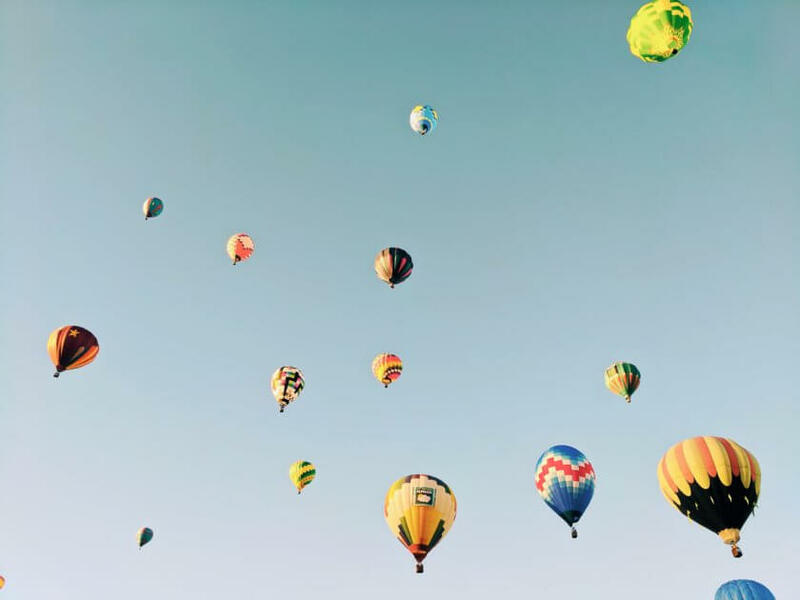 You essentially have a pretty good chance of finding them and capturing the balloons amongst various settings depending on your vision (i.e., the beach, over skyscrapers etc.). It may be a bit of a red-eye way to start the day but I think it’s totally worth it for that magical shot. 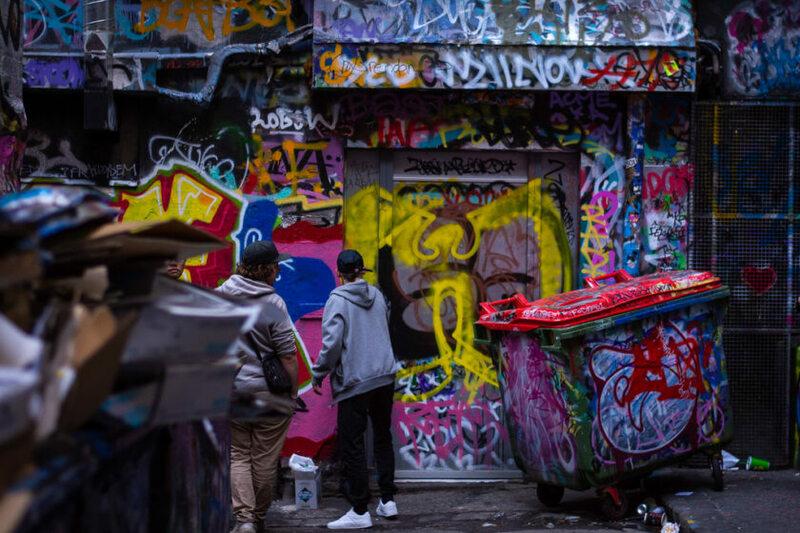 Nestled down a bluestone pedestrian laneway a few minutes walk from Flinders Street Station, you will find one of the most popular and finest examples of the alternative art Melbourne is famous for – Hosier Lane. 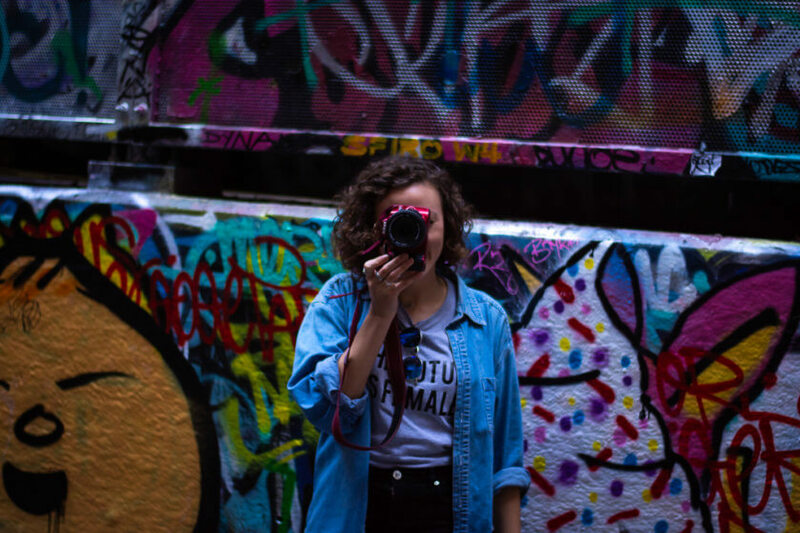 Littered with all forms of colourful and thought-provoking graffiti, Hosier Lane is perfect to capture some quirky and edgy portraits or simply some cool street scenes. Hosier Lane is essentially a public gallery for urban artists that is constantly changing and evolving day by day. It’s a totally unique canvas meaning you can never quite capture the same perspective twice. The laneway isn’t all 2D though – there are also loads of hidden pieces of 3D artwork nestled in gutters or doorways so although it’s a small area, there is plenty to see and capture. Go late afternoon to experience some dramatic natural lighting. 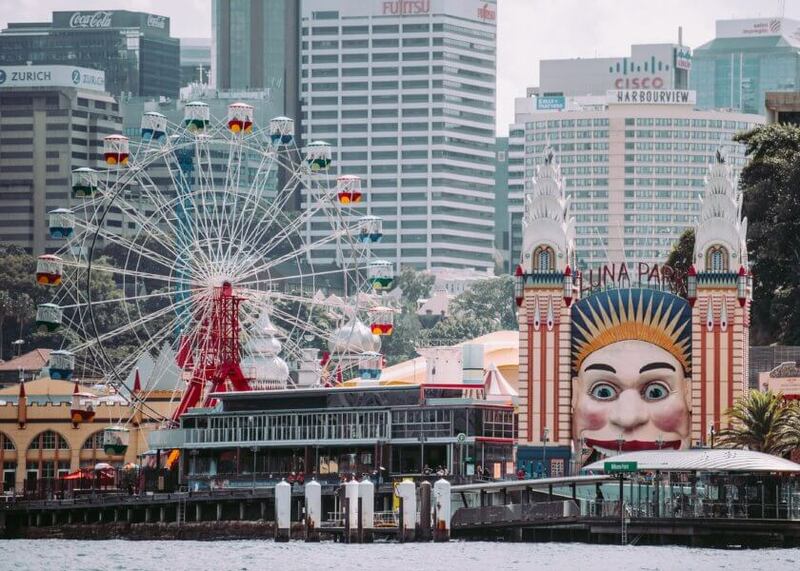 Luna park is a historic amusement park that has been in operation since its opening back in 1912. Located on the foreshore of Port Philip Bay in St. Kilda, it is an iconic symbol of the area mainly because it has retained many original features from the early 20th century. It also holds the title of being home to the oldest continually running wooden roller coaster in the world! The enormous caricature face at the entrance to the park (where guests have to walk through the mouth to enter) is creepily photogenic as are the classic carousels, Ferris wheel and carnival themed rides. Yes it’s true! 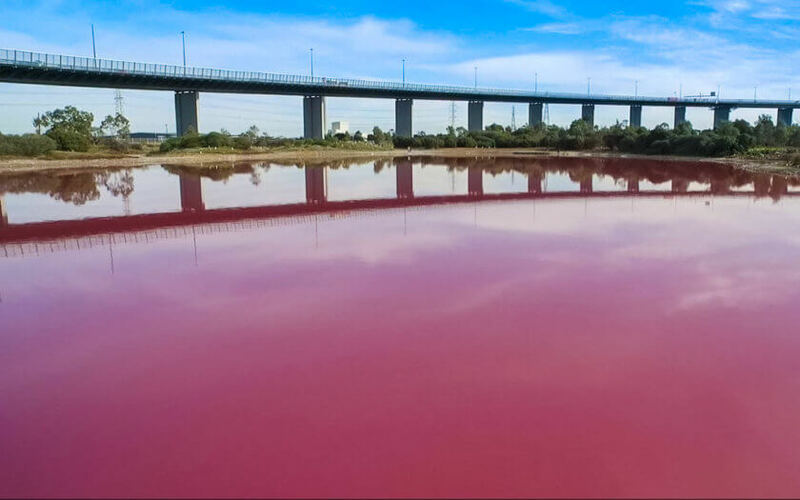 You don’t even have to stray to the far away lakes of Bolivia or even to Western Australia to take a picture of a spectacular cerise lake – there is one nestled right smack bang in the middle of Melbourne city. You can find this natural algae phenomenon at Westgate Park in Port Melbourne. The colour does vary depending on the season though, so it is best to look up some reviews first on TripAdvisor before you set out. However when you do go, make sure you pick a bright, sunny day to bring out the full colour of this unusual lake. Naked for Satan is a popular Spanish tapas and cocktail bar located in the hipster suburb of Fitzroy. At the top of the four level building, you will find a terrace bar and restaurant that has 180 degree views over the city. 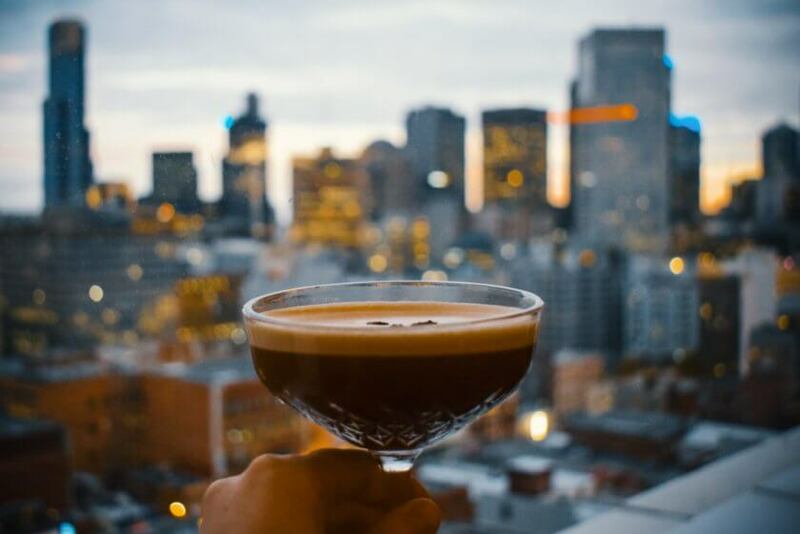 It’s ideal for getting some sunset shots of the city skyline from a height, whilst sipping on a few vodka infused cocktail specialities. Naked for Satan does get pretty busy though (even in the winter as they have heaters) so it is best to get yourself there before sunset to reserve yourself a spot with good views. 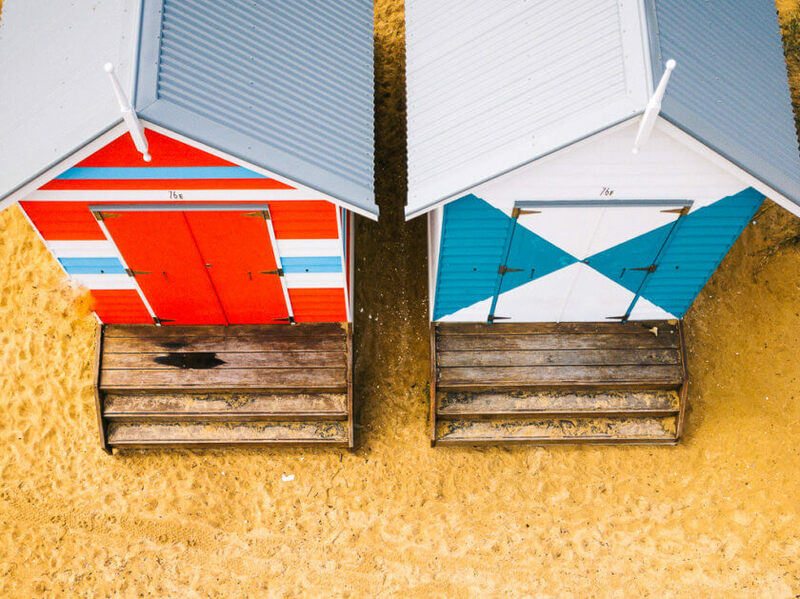 The funky beach huts that line the shores of Brighton Beach will no doubt give your Instagram feed a major splash of colour. Each beach box has been decorated in bright and bold paints by their owners and as a result they have become quite an eye-catching photo spot. Capture in daylight for a fun, pop art vibe or during blue or golden hour for a completely different serene feel. A modern and lively 24-hour city such as Melbourne glitters and shines from all angles by night. 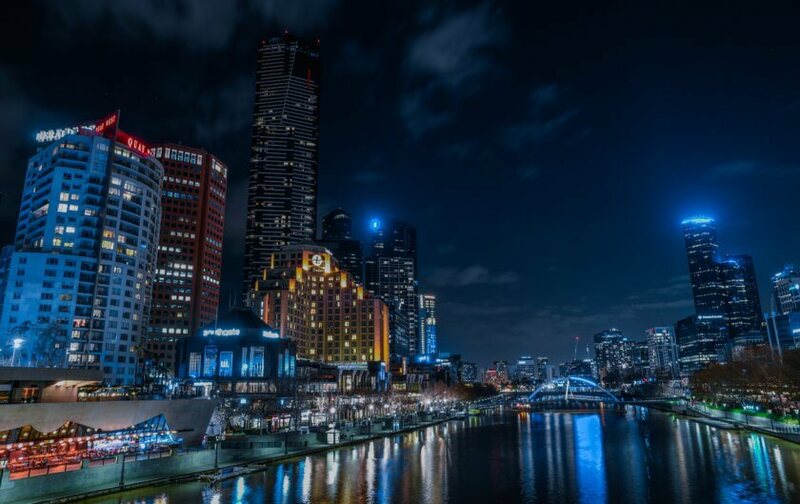 If you’re into your night time photography, you can catch some truly magical shots of the cityscape as you walk along the shimmering Yarra River. The architecture of the city is an interesting fusion of statuesque Art Deco builds, heritage cathedrals, contemporary towers and neoclassical facades. Be sure to include these and some iconic buildings such as the Crown Casino and Rialto Towers. To best capture the movement and buzz of this bustling urban hub, set up your camera on a tripod to do a long-exposure shot. 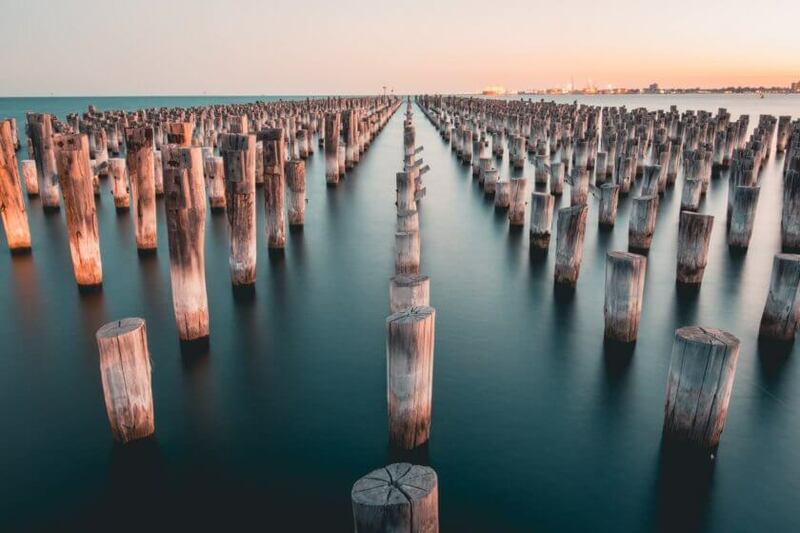 Just next to Station Pier lies the historic remnants of Princes Pier, an important heritage site for Melbourne’s maritime history. The uniformed pattern of wooden foundations jutting from the sea are a dramatic sight, especially at sunset. I always think they’d make a great backdrop for a dramatic portrait in a stunning dress that flickers in the wind! The State Library is the central library of the state of Victoria and not only is it the oldest library in the whole of Victoria, it was also one of the landmark first free libraries in the world. Built in 1854, the building facade is an impressively grand pillared structure and the forecourt a lovely green space including a number of striking statues. However it is the rooms inside that are the true architectural feat. 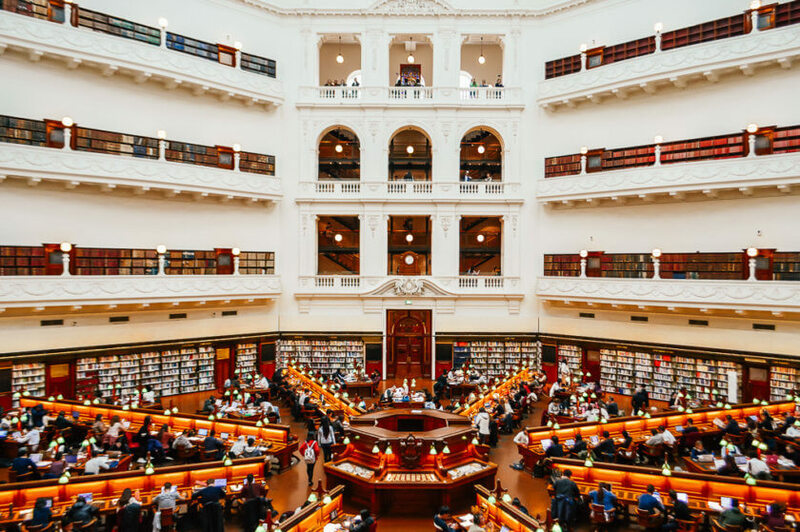 The La Trobe Reading Room is a stunning octagonal six story high dome, with upper galleries, space to hold 32,000 books and 320 readers at their gorgeous wooden, leather bound desks. The room is fantastically symmetrical, bright, and probably unlike any space you have ever seen before. You may not notice, let alone even think twice about capturing one of the many bridges in Melbourne. During the day they seem to be a stark road functionality; built to simply get the mass of cars from A to B. It is only until the sun sets that they take on a new character, bringing a colourful architectural light show to the sky. The Melbourne Star (essentially a copycat of the London Eye) also takes a new form at night. 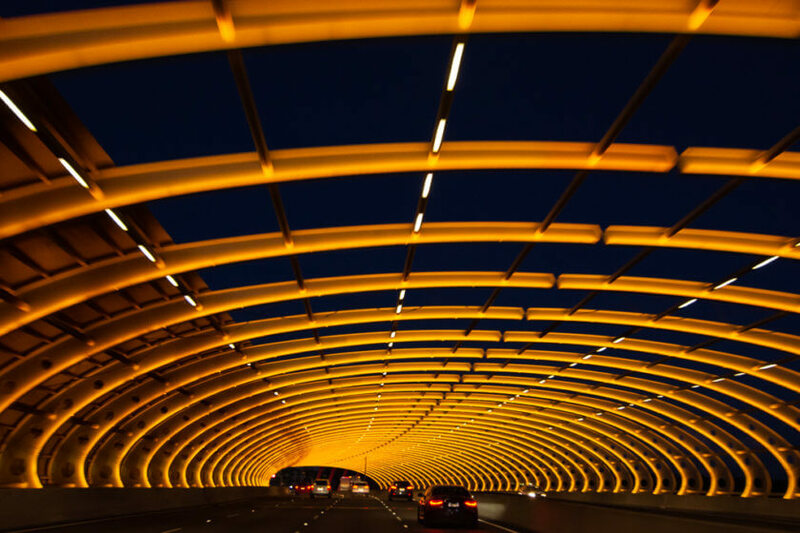 Most evenings it is transformed with a new pattern or colour theme, bewitching the Melbourne skyline from all angles – be it from the pedestrian walkways or simply the road as you pass through. If you live or have been to Melbourne, what other photogenic spots would you add to this list?